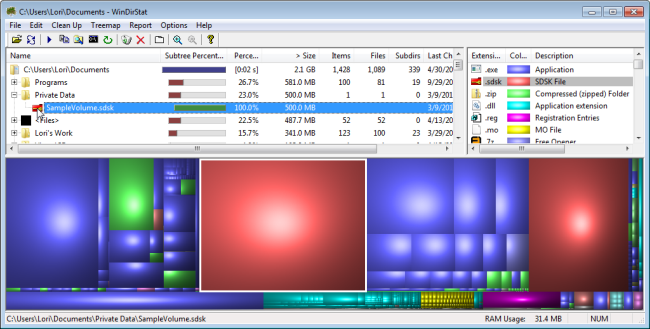 Editor’s Note: WinDirStat is a great tool and is usually our first choice for figuring out where our drive space went to. When WinDirStat (Download from Ninite) starts, it reads the whole directory tree once and presents it in three useful views. The directory list, which resembles the tree view in Windows Explorer, displays on the upper left and is sorted by file/subtree size. The extension list is a legend that displays on the upper right and shows statistics about the different files types. The treemap takes up the bottom of the WinDirStat window. Each colored rectangle represents a file or directory, and the rectangles are nested, representing subdirectories and files within the directories. The area of each rectangle is proportional to the size of the files or subtrees. The colors of the rectangles for files indicate the file extensions that correspond to the extension list.